Propulsion two Fairbanks Morse 38D8 1/8 diesel engines (Serial No. 832369 and 832370), Westinghouse single reduction gear, two shafts. 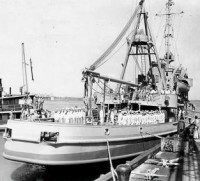 On 27 July 43, PC--618 put to sea with Big Horn and PC--617 as part of Convoy UGS--13 in hopes of a more successful U-boat hunt. Again, however, she and her associates failed to make a kill. The decoy ship Big Horn again straggled about 50 miles behind the convoy while the two patrol craft waited just over the horizon. On one occasion, Big Horn sighted a submarine, and one of the escorts attacked the U-boat, unsuccessfully, with her mousetrap battery. 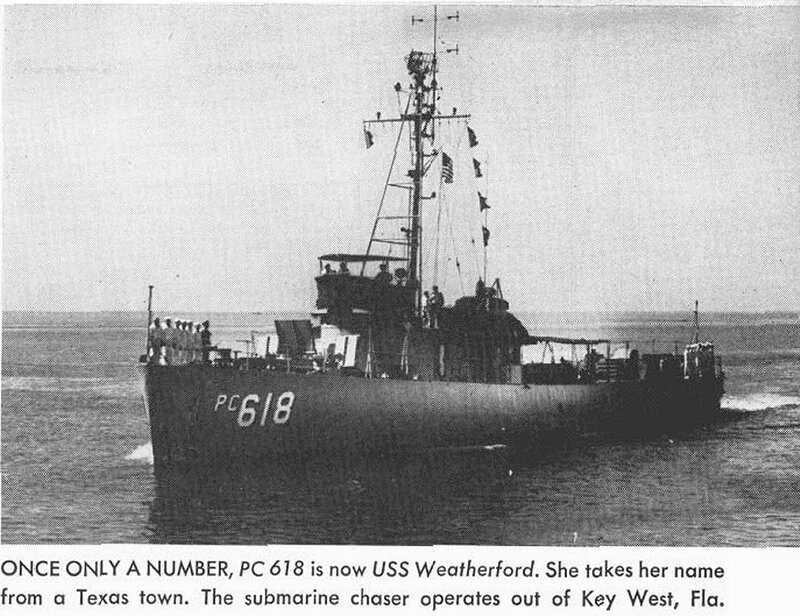 Otherwise, the cruise proved uneventful, and PC--618 returned to New York in August with no submarines to her credit. After another hunting cruise in the vicinity of Recife, Brazil, conducted in the latter half of August and the month of September 43, PC-618 returned to New York early in October for additional training. In November, the Big Horn decoy/killer group was reconstituted for one final, but also unsuccessful, cruise in the area around Bermuda. That assignment ended late in December at Boston, and the group was dissolved for the last time.